Yes, I'm still searching for The Ultimate Question and until I find it, I have decided that 42 is what I will be. As you might have guessed, it is that day again. It never fails to amaze me how it creeps up on me so quickly after the last one. The past year has been full of successes and that makes me incredibly happy. Big contracts and small contracts at work; each one fulfilling in its own way. On the personal front, new and old friends have provided much laughter and support. My family remains my rock and the center of my world. Sometimes, I am the center of my own world and that is a lot of fun, too. Today, I will attempt to scale my first peak. Not a fourteener but a strenuous and tough hike nevertheless. Flattop Mountain stands at 12,324 ft; the round trip is 8.8 miles; the elevation gain is 2,849 ft. The last two miles (I think) are brutal and above treeline. It's not necessarily a big deal in these parts but it is for me. We attempted this hike as a family at the beginning of August of last year. By the time we crossed treeline, Medha was a little pale from the quick gain in altitude and the wind wanted us to sail with it. We trudged on for a while but gave up just short of the Emerald Lake Overlook. This hike and our time together is my birthday gift this year. The goal is to make it to the summit, of course, but it will be just fine with me if I make it only up to the Emerald Overlook. Join me wherever you are by setting aside some time for an outdoor activity with your family and friends. I don't have a recipe for you today. What I have are pictures from our 5th annual Elk Bugling camping trip in Rocky Mountain National Park. Every year, we camp in Moraine Campgrounds at what we think will be the height of the rut. We book up to a dozen campsites, hike the trails over the weekend and get together for a massive potluck. It's a neighborhood tradition, with some families doing it year after year for over 16 years. It is considered so important that some families come up in shifts, hand over children at Lyons, or make two trips so that each child spends at least one night camping to the bugling of bull elk. Others come up just for the potluck. We are called the Bennett people, because the Bennetts make our reservations each year. Driving into the campgrounds is like driving into our neighborhood, tents instead of houses. Hey! Hi! You're here already? Got a hike planned for tomorrow? I forgot to bring salt again, can I borrow some from you? In 2006, we were snowed on and the wind tried to whip our tents from under us. In 2007, it was windy and cold. We also saw the top of our tent at close quarters several times the first night. 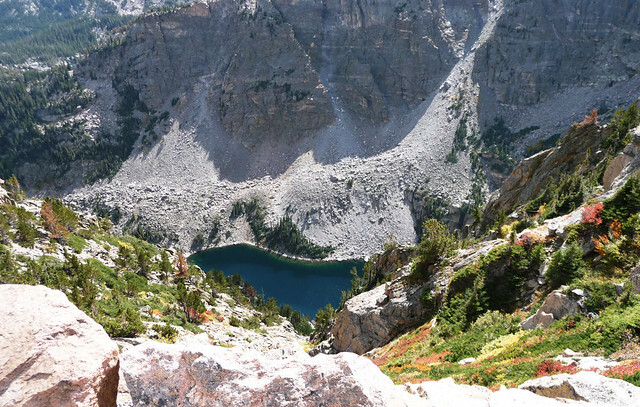 In 2008, it was pleasantly cool and it was also the first time Medha and I hiked without D. Medha, her friend and I hiked the short but steep Gem Lake hike and were rewarded with thunder, overhead lightning, rain and hail. 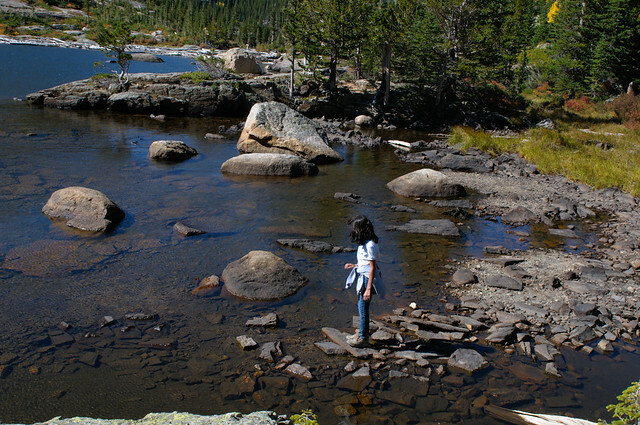 In 2009, it was warm and we hiked to Lake Haiyaha and had a blast clambering over the rocky shores of the lake. In 2010, it was as hot as summer and very dry. There were splotches of color but nothing spectacular. 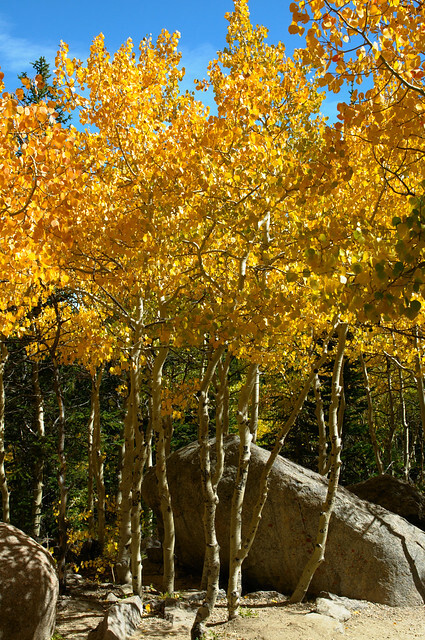 Our region is known more for its gold hues - Colorado gold - rather than the range of colors that adorn New England. 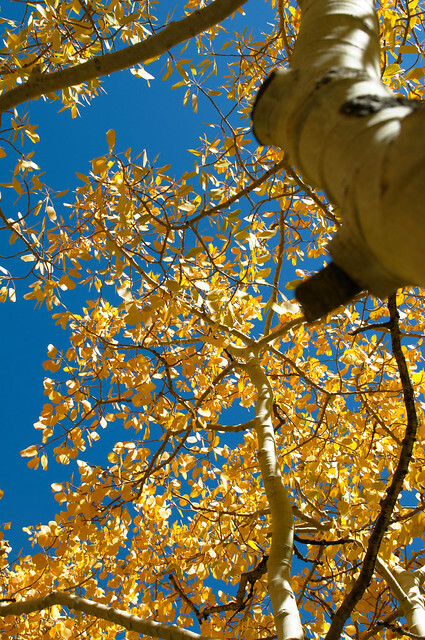 Nothing beats gold aspen leaves waving in the breeze, saying their final goodbyes. I forgot that I can do video with my new camera and used my P&S instead. I still think it is beautiful though. 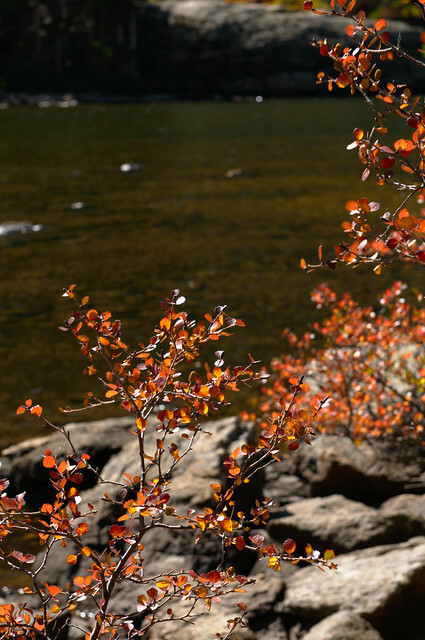 We found these young aspen trees along the Alberta Falls trail to Mills Lake. 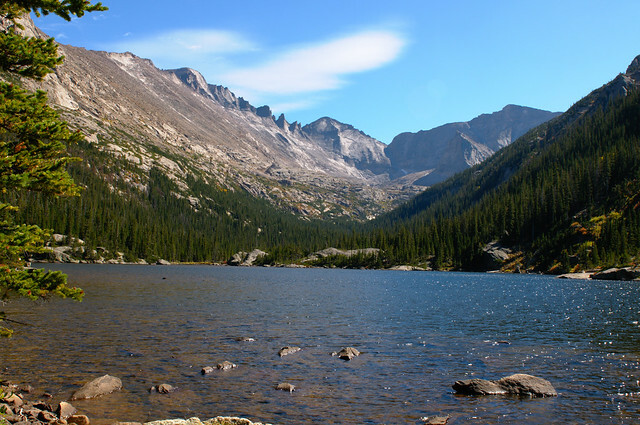 We hiked beyond Alberta falls to Mills Lake, nestled in a rocky basin just shy of 10,000ft, with glorious views of my favorite fourteener, Longs Peak. The sun was high in the sky, creating a blue haze around the peaks. I think this is the closest I have come to Long Peaks. Are you thinking what I think you're thinking? If so, the answer is yes. And he almost fell in this time. Well Happy Birthday! Your birthday present sounds like a lot of fun-hope you do make it to the summit! Happy B'day Dear Manisha and have a wonderful hiking day. And i think it is one of the best gifts , to spend time together with your family on this special day. That is a great way to spend your birthday. Happy Birthday Manisha. Now I wish I lived in Colorado instead of boring, flat Tx where there are no mountains to climb and no interesting trees. I hope you'll have a great birthday, and it certainly sounds like you will! Happy Birthday! Have a memorable hike. Gosh, your images are always captivating. The one with looking up to the sky from under the tree has me mesmerized. Happy Birthday dear ! !These are beautiful photos..Love them.. Happy Bday Manisha! What a coincidence as we hiked Mission Peak yesterday - not sure if you can call it a mountain but a peak nevertheless - and it was great! Hope you had a great day too. What a nice way to spend a birthday. Unforgettable. Wish you a very happy birthday and thank you for all the lovely pics. My wish for you for a dashing next year.. Follow every byway, every path you know. Follow every rainbow, 'til you find your dream! Hugs to you, i simply adore your blog. Beautiful pictures and a beautiful birthday, it looks like. You are fierce, Miss! That's a big hike! Happy Birthday! This looks like a breathtaking hike, and gorgeous photos! I did it! It took us 8 hours but we did it! It was tough and there were times when it felt like it was endless but it was a great feeling to finally reach the summit! We also had the world's best boiled eggs with lots of salt at a little over 12,000ft. An experience that now surpasses eating idlis in hot sambar for breakfast, at 8500ft with a mix of snow and freezing rain melting into the sambar. GB, Thank you! It was mind over body for all of us. We're not necessarily very fit so this was a huge achievement not just for me but for Medha, too! Happy Cook, thanks! The hike was very special because my family was with me. I also met two of my dear friends on the trail who gave me the best birthday hugs! Jaya, thanks! I think it was a great way to spend my birthday and I'd do it all over again! You don't need mountains. It's the challenge and who you do it with - at least that's how it is for me! The other thing to do is visit Colorado. There's something to do all year around! Kalyn, thank you! I did. It was very special. 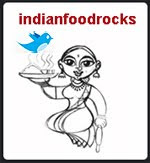 Anjali, thanks! Very memorable! I was very sore for a couple of days thereafter! Cynthia, thank you! Colorado is beautiful like that! I love it here! Sulagna, thanks! Glad you enjoyed my pics! A-Kay, thank you! Coincidence or not, I'm so glad you went on a hike! I've read about Mission Peak and it's not an easy hike! The altitude gain is more than that for Flattop as is the one-way trip. Maybe now that I have done Flattop, I might want to try Mission Peak! Lots more oxygen on that hike! AA_Mom, thank you so much! I hope your twins are doing well and driving you nuts! Poornima, thank you! It's a birthday hike none of us will forget easily, that's for sure. Archana, thank you and likewise, my friend! Your creativity blows me away but you already know that! Hugs to you and I hope you are doing well! TKW, thank you and I'm looking for a hug IRL from you soon! It's an awesome hike. It's mind over body. It's "do I have feet cos I can't feel them so how am I still walking" kind of a hike. Luckily the wind held still and the clouds didn't threaten on the way up else it would have been even more brutal! Jen, thank you! Anything you make is always special! I'm so proud of me, too! See you as soon as you give those traveling feet a rest! Tasty, thank you! It was wonderful with great views. There could have been better views from the top had we chosen to walk around the edge of the summit. But we had clouds approaching us from the west, the wind was picking up too and at least 2 miles before we were below treeline. So we headed back down. No regrets though! Miri, thank you! I had a blast! Couldn't have asked for anything better on my birthday! I did join you in spending time out with family last weekend...Oct 3 we climbed a hill at Shravanbelagola to see the Gomateshwara statue there! :) Yes, not a patch on your climb but nevertheless. We also visited two spectacular, really old (some 800years!) temples built in the time of the Hoysalas! Belated Birthday wishes ,Manisha, hope u had a lovely day hiking. Hope the year ahead is full of happiness and success and good health. belated birthday Manisha, what a beautiful way to celebrate the day. 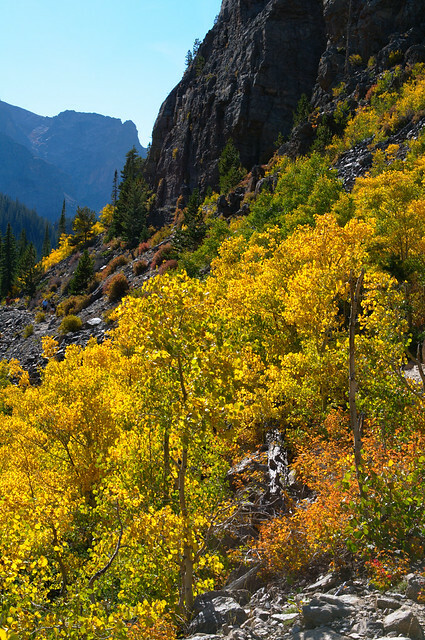 Love the change of colors, must visit colorado sometime.